The Southridge Dental team is passionate about preventive dentistry. We work hard to help our patients achieve and maintain their healthiest smiles. 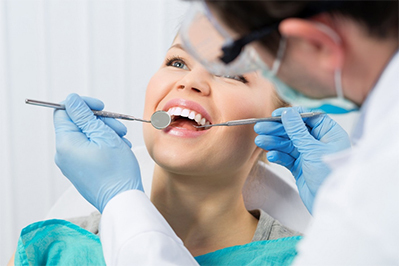 Since even the most dedicated daily oral hygiene routine can’t always prevent all oral health issues, our Denton dental office also provides a wide range of restorative dentistry services. Our restorative treatments will repair the full form and function of smiles as well as renewing oral health and preserving a healthy, natural dental appearance. Keep reading to find out more about some of our high quality restorative dentistry services, or contact the Southridge Dental team to find out more today. Traditionally, dentists used metal amalgams to repair damaged or decayed teeth. These metal fillings repaired teeth, but they also impacted the appearance of patients’ smiles. Today, most dentists have shifted completely to the cosmetically superior, tooth-colored composite resin filling. This material allows us to create a natural looking restoration that preserves natural tooth structure and lasts for years. Dental crowns and fixed bridges are two of the most commonly used restorations. Crowns can be fitted over the tops of teeth that are too damaged or decayed to be repaired with the more conservative composite resin filling. We also use dental crowns to protect root canal treated teeth. A fixed bridge uses dental crowns attached to healthy teeth to support one or more replacement teeth. Both restorations are available in a variety of materials to ensure patients achieve their desired results. For patients with advanced tooth loss, partial or full dentures offer effective smile repair. Our custom crafted partials fit snuggly between remaining healthy teeth held in place by metal brackets attached to the surrounding teeth. Full dentures are molded to fit against the gum line to create suction that will hold these prosthetics in position. Some patients also use small amounts of denture adhesive to provide additional stability. Replacing missing teeth traditionally relies on restorations that only repair the parts of the tooth we see above the gum line. Dental implant supported prosthetics are the only tooth replacement solutions that replace the root system as well as the crown of the lost tooth. This versatile tooth replacement option can be used to replace a single tooth or a complete row of teeth. Root canals have a bad reputation, but they are actually pain relieving, smile restoring procedures. When tooth decay or damage reaches the inner pulp layers of teeth where the nerve system is housed, the result is dental sensitivity and severe toothache. Root canal therapy removes the affected pulp and nerve tissue and repairs the damaged tooth, leaving patients with whole, healthy smiles and preventing unnecessary tooth loss.